Watches have been a presence in our lives for over 600 years. In fact, clocks can be regarded as one of the oldest devices that were created by our ancestors. By giving us the means to track time, build schedules and control the flow of our daily routine, clocks managed to forge the look of the modern civilization as we know it today. Being the biggest supplier of watch loans, Casino Pawn And Gold is able to make a watch loans on any and all fine watches, located in Casa Grande. We have over 20 years of experience so you can be sure you are getting the most money for your timepieces when stopping into our pawn shop in Casa Grande, serving the surrounding areas of Coolidge, Maricopa, Eloy, Arizona City, and the Florence Area. What type of watches do you provide Watch Loans for? 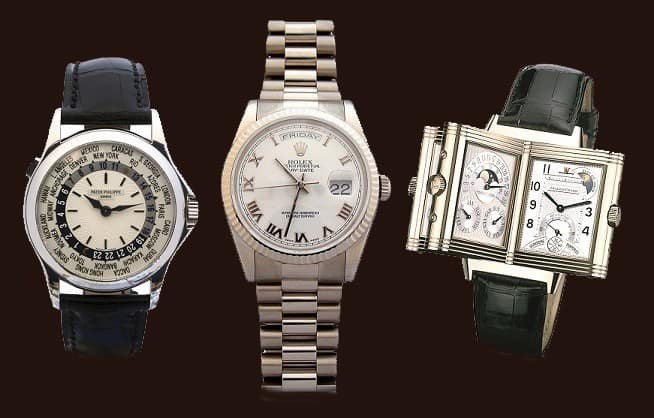 We will loan on Rolex, Cartier, Breitling, Panerai, Hublot, IWC, Patek Philippe, Audemars Piguet, Girard-Perregaux, and many more with our highly rated watch loans. And this list is not exclusive! It's important to keep in mind that at Casino Pawn and Gold our watch loans are based solely on the value of your watch. It doesn't matter what the brand is as long as the watch has any kind of value whatsoever. In the past, we've even made watch loans on Rolex bands simply because the bands were worth money without the watch face. If your watch is secondhand for any kind of cash, then we can almost guarantee that you can get a loan on it. While in most cases we can have you in and out of our store in a matter of minutes, some of the more high end watches can take some extra time to authenticate. For example, Rolex watches have serial numbers hidden underneath the band which takes a bit of time to validate. If you've got a higher end watch we always suggest contacting us beforehand so that we can discuss loan offers before you come on down to our pawn shop. How do the watch loans work? Watch loans are written, by law, for 3 months. During this 90 day period, you're more than welcome to come and pay off your watch loan with no prepayment penalty whatsoever. You'll simply pay off the interest that's accrued up to that point, plus the principal balance, and we'll send you on your way with your watch in hand. If come the end of the ninety day term, you simply don't have the money to pay off the watch loan, we're more than welcome to extend it for a period of another ninety days. All that's necessary is for you to pay off all the interest, and we'll reset the loan for you. At Casino Pawn and Gold, we're here to help our residents get back to financial security, not set them back any further. If you need more money during the ninety days, then bring another watch! Each of our loans is not specific to the person, but specific to each piece of collateral you bring down to us. If the amount from one watch loan doesn't suit your needs, then you can certainly use more than one to get the full amount of cash that you need. Don't forget we also serve the surrounding areas of Coolidge, Maricopa, Eloy, Arizona City, and the Florence Area.